Welcome to Cougar Vineyard and Winery located on the "De Portola Wine Trail" in beautiful Southern California Temecula Valley Wine Country. We specialize in 100% Estate Italian varietals. All our wines are produced at the winery. We currently farm approximately 17 family acres. 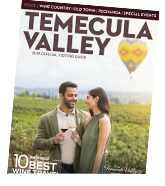 Join us next time you go to Temecula wine tasting for some of the best selection of Italian varietals around.